﻿ Stool Perriand tripod in beautiful wood. three-legged stool, ca. 1947. From the l’Equipement de la Maison series. Not produced for the Chandigarh project. Produced by Galerie Steph Simon. Stool Perriand designed that stool and tabouret of wood. Edition Steph Simon from Paris did it on a wonderful and important way. Rare collector piece from the Moma. Check out of auctions like wright20. Offering object in Zurich. Rare to get in Paris, New York and London. All museums are offering that piece. Fantastic time with Charlotte Perriand and Jean Prouvé. Together with Le Corbusier they did fantastic furniture. Furniture is important for living. That litte seat, produced today by Cassina. Than it was done by Steph Simon and is today very good done. A team of architects and great designers created cansado or the Les Arces in France. So Japan got important for her and she travelled to make tables and chairs. A lot of black oak and other wood. 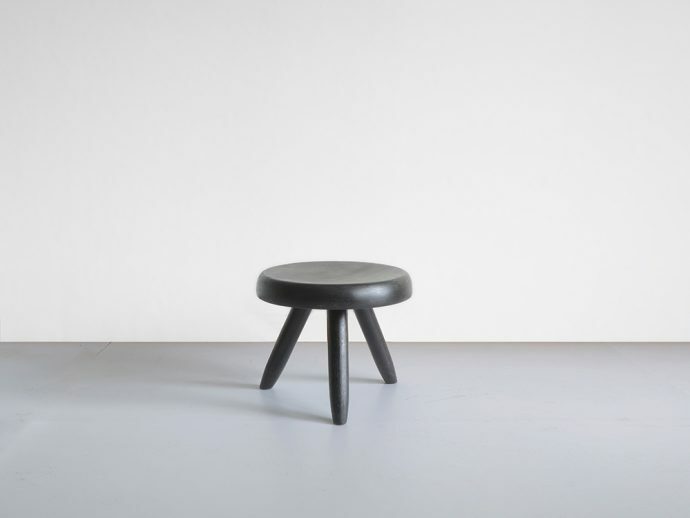 Real a beautiful stool with 3 legs. That stool is a way to understand the World. My creative artist does a good job by searching for that pieces. We sell it in our gallery. Come and buy it.